A new option, New Criteria Type, has been added to the audience targeting section in Community Workspaces. You can now use the User Object to narrow your focus onto specific audiences. This allows you to target audiences based on user information, including their country, town, company name, title, etc. Let’s say you would like to show specific content to your customers from France. 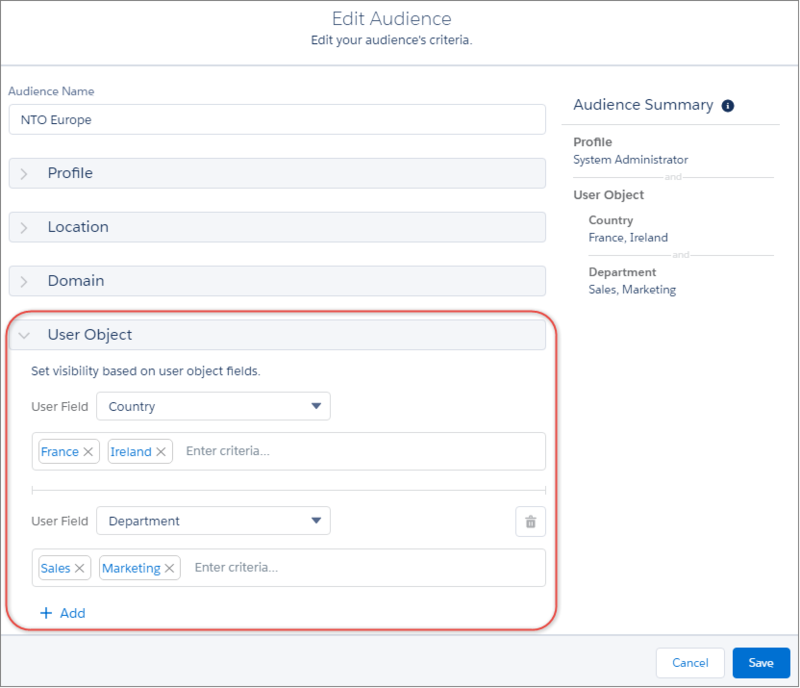 Simply use the User Object criteria type to edit the Country field. It will provide more accurate results than the Location criteria type that only works with users’ IP addresses. You will be able to choose several text or picklist fields on the User Object to create an appropriate audience. With this feature, you can decide what to show first to people who belong to several different audiences. You can choose which branding set or page variation will be given priority for a particular audience. To prioritise what people from different audiences see, drag and drop the page variation or a branding set to the appropriate position. You will then be able to see its priority. To define the priority of a branding set, go to the list view in the Branding Sets area. You will see the priority column, if you have two or more assigned audiences in addition to the default one. Users that are not included in any audience will see the default branding set or page variation. The default audience does not have a priority.